Are you trying to learn how to find a domain name owner, but don’t know where to start? If you want to find the owner of a domain name, it’s essential to first understand the meaning of a domain name. It’s helpful to think of the relationship between a domain name and a website in the same way you think of your home address. When you look up a website, you enter the domain name (the address) so that you can be delivered to a specific website. In order to find a single website, you need an exact domain name. Every web address on the internet concludes with a string of letters called domain name extensions or TLDs. TLD is an abbreviation that stands for Top Level Domain. There are hundreds of TLDs in existence, and more are added regularly. The most famous, and the one used for the vast majority of websites, is .com. It’s possible for virtually anyone to sign up for a .com TLD if the domain name is available, but other extensions are more restricted. For example, if you want to sign up for .museum, which designates museums, museum organizations, and individuals within the museum profession, you must be able to furnish proof that you’re a museum or an affiliate. When you’re looking for a domain name owner, it’s vital to know which TLD is associated with the web address. Running a search with a .net TLD instead of .com can potentially direct you to an entirely different website. Domain names are owned by whoever first registered the web address with an accredited registrar, such as Domain.com. In order for that person to maintain ownership, they have to pay registration fees and ensure that all of their contact details are up to date. Once a person has legally registered for a domain name, and has given all of the relevant personal information to an accredited registrar, that individual owns the rights to that web address. They are in sole possession of that web address and have the right to sell it at any time. The owner can transfer domain name ownership to a new user if they care to do so. Typically, the standard domain ownership period is two years. However, depending on extensions, it’s possible to register a domain name for up to 10 years. Renewal is also an option for people who don’t want to commit to a multi-year deal. Domain owners pay an annual fee, which varies based on the TLD they’ve chosen. Since the year 2000, Domain.com has offered some of the most affordable TLD registration and renewal fees available. Why look up a domain owner? There are many reasons someone would want to look up a domain owner. Often, it’s because the owner can furnish information about the domain and website that no one else can. It’s also common for domain owners to search themselves in order to confirm that their website is being accurately represented online. Make a purchase: Most often, a person looking up the owner of a domain is interested in purchasing that domain name. There are hundreds of millions that are registered, and for many individuals and business, their ideal domain has already been claimed by someone else. Sometimes, the process of purchasing a pre-existing domain is as simple as making contact with the domain owner and striking a deal. Often, it’s much more complicated, but it all depends on the domain name owner, any plans they may have for the website, and their willingness to negotiate. Ask about products or services: Sometimes, a website might not provide all of the necessary information related to its products or services. In cases like these, the domain owner may be able to fill in the gaps or answer questions that might not be answered on the website. Verify authenticity: Before conducting business through a website, it’s important to make sure that the website is exactly what it claims to be. The internet is a hotbed of misinformation, and it’s surprisingly easy for websites to misrepresent themselves, either intentionally or otherwise.Researching the domain owner can help verify that a website is legitimate, which can offer peace of mind to parties seeking to engage in financial transactions. Similarly, confirming the legitimacy of a website can make it easier to trust whatever information may be offered. Report a technical problem: If a website is malfunctioning and there are no obvious ways to report the problem, it can help to contact the owner directly. The owner is invested in the website’s upkeep, and will often be grateful to have been alerted of an issue. Confirm your own information: If you own a domain, it’s important to verify that your website’s information is being accurately represented in searches. There are hundreds of millions of registered domains, and information errors are virtually guaranteed. If you plan to sell your domain at some point, ensuring that your personal data is up to date can help potential buyers get in touch with you. If you know a website’s domain name, there are a few ways to discover the identity of the owner. In most cases, the easiest way to find a domain name owner is by searching WHOIS databases. If a WHOIS search fails, there are several other strategies for identifying a domain name owner. These are free, publicly available search tools that contain almost every single website and domain name. WHOIS services work in conjunction with registrars like Domain.com, collecting all of the information related to the purchase, sale, and transfer of domain names. There are various WHOIS databases and all of them are coordinated through Internet Corporation for Assigned Names and Numbers (ICANN). ICANN is a nonprofit that ensures the maintenance and security of domain names, websites, and other internet namespaces. Since 1998, they’ve coordinated a central registry that contains all recorded domains. WHOIS was constructed to be as simple as possible. The Internet contains an overwhelming amount of information and ICANN has remained committed to ensuring that domain ownership remains transparent. When you run a search on a WHOIS database, the website taps into ICANN’s central registry and pulls all of the information, present and historical, related to the domain that you’ve searched. 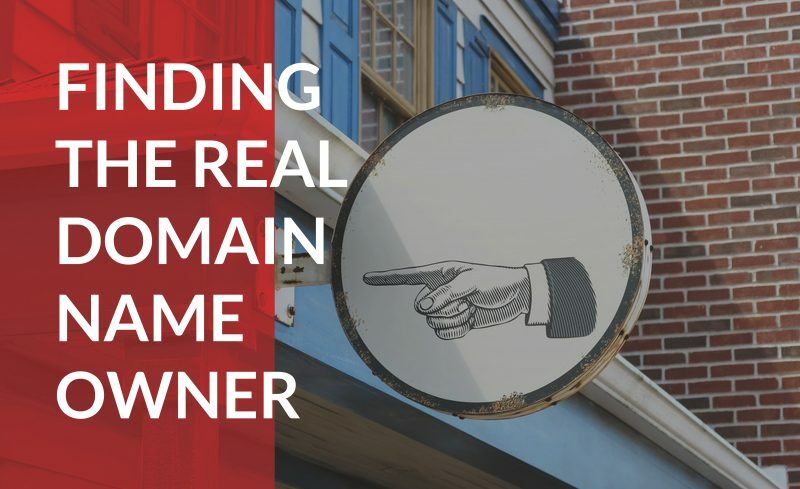 You should be able to easily find essential information about the owner, such as their name, contact information, any past ownership, and the domain’s expiration date. Some WHOIS databases will go even further and furnish website statistics such as traffic and performance as well as other domains that a given owner might possess. While ICANN and WHOIS attempt to be as comprehensive as possible, it’s possible, even legal, to mask some of the most essential ownership information. The most common method used by domain owners is a tactic called proxy registration. In these cases, owners have paid or struck deals with companies or organizations to act as the registrants on record. When you search for a domain that has been masked by a proxy registrant, the information reported will provide no helpful clues as to who the real owner is. However, if you are determined to find the real owner of a website and have discovered a proxy registrant, there are research techniques you can use to acquire the information. After you’ve pulled up the domain on WHOIS, check the ownership history. Sometimes, it’s possible to see when the transfer from owner to proxy occurred and thereby identify the original owner. If you encounter other privacy settings, look for information that predates those settings. If the owner has registered other websites, look them up on WHOIS and see if they contain any updated contact information. In other cases, domain owners may have failed to update their contact information. Unless the updated contact information somehow interferes with the ability of the domain registrar to collect their annual fee, this misinformation tends to linger, sometimes indefinitely. If you attempt to find a domain name owner through the WHOIS databases but fail to uncover the desired information, there are a few other research methods you should try before giving up. Even if the domain name owner has hidden their information on the WHOIS database, the website itself might be able to furnish contact information. Scroll around, paying particular attention to the top and bottom of the page, searching for links that read “contact information,” or something similar. Even if it doesn’t connect you directly to the owner, they might point you in the direction of someone who knows. Scan any and all social media accounts associated with the domain name or website you’re looking into. Consider resources like LinkedIn, Facebook, Twitter, and Instagram. Again, look for any reference to “contact information” or email addresses that might be visible. If you’ve consulted WHOIS databases or otherwise discovered the identity of the domain name owner, the next step for those looking to purchase a domain name is to negotiate with the owner. It’s important to remember that as long as an owner’s domain registration hasn’t expired, they retain complete control over the name and can either sell it or keep it, as desired. Sometimes, even if you’ve discovered the perfect domain name, the owner might be unwilling to put it up for sale. Circumstances like these arise rather frequently; for that reason, it’s important to keep an open mind and be willing to entertain the idea of registering an alternative name. Send an email or otherwise get in contact with the owner by using the information you’ve acquired through research. Reach out with a positive attitude. Even if there won’t be any face-to-face negotiations, it’s important to be friendly. Once you agree to the deal, exchange payment for ownership. If you’ve managed to secure a domain name, but haven’t registered it for domain privacy, your private information will be available to anyone who conducts a WHOIS database search. If you’re not comfortable with having your information so readily accessible, but are set on domain ownership, Domain.com offers Domain Privacy registration for several TLD domain extensions. If you register for Domain privacy, a WHOIS database search for your domain will report Domain.com’s information instead of your personal information. In effect, Domain.com will mask all of the personal details that you don’t want to be shared with the public. Registering for Domain Privacy does not mean that you sacrifice any control over your domain–you retain total ownership. Unfortunately, not all TLDs qualify for Domain Extension privacy. Domain Privacy is only available to .com, .co, .net, .org, .tv, .info, and .mobi domain extensions. Now that we’ve covered how to find the owner of a domain name, it’s necessary to understand why domain names are important in the first place. Domain names are there to help websites be located and categorized. However, for companies and individuals, domain names can be the difference between a thriving web presence and one that has trouble getting off the ground. When you’re the owner of a domain name, your business or personal website gains credibility. Many internet users are rightfully skeptical of unknown websites, and when your domain name is tailored to your business, it gives your company a sense of trustworthiness that it might not have otherwise. If a company’s domain name is related to the services they provide, it becomes easier for internet users to find them, even if they haven’t heard of the company before. People who use a search engine to look up services or goods will have a higher chance of being directed to the company’s website, especially if the content on that website has been optimized for search engines.